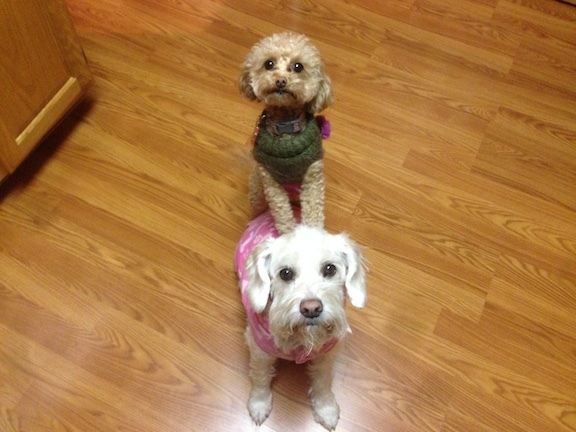 For this session I worked with Lucy (top) a two year old Toy Apricot Poodle who over barks and has occasional potty issues and Lilly an eight-year-old Schnauzer / Cocker Mix who gets excited whenever Lucy does. It only took a moment to see that this was an excitable pair of dogs who’s issues came from a lack of rules or limits from their owners. The dogs jumped up on the furniture or people whenever they felt like it, showed no understanding of the concept of personal space and to make matters worse, their owners rewarded them with petting or attention any time the dogs jumped up on them or nudged for attention. I started things off by suggesting that their owners adopt a few basic rules and boundaries where the dogs were concerned. While their owners intentionally adopted lap dogs, allowing them on the furniture whenever they wished was sending the wrong message. To dogs, the height that they sit has a correlation to their perceived rank amongst the members of the family. I suggested that they make the furniture off limits for the next month to help the dogs see a literal different between themselves and their human counterparts. This will have the additional benefit of stoping the dogs from jumping up or climbing all over their owners. Next I went over some new methods of communicating with the dogs. Because excitement is an issue for this pair, communicating non verbally will help the dogs learn to take commands and corrections without adding any additional energy. I also went over how to disagree with unwanted behavior and how important it is to disagree as soon as the dogs start up. Most dog owners let their dogs go and go until the energy gets borderline out of control. A much better and more effective strategy is to observe the dogs when they start to engage in and activity that gets the excited and to pause or stop it before it gets to be too much. But if you consistently interrupt the dogs a specific energy level, they can learn that is the threshold to stay below. Believe me, having a dog or dogs that can self regulate is an amazing skill. Next I went through a leadership exercise and how to train or retrain some basic commands. The dogs picked up on the leadership exercise really quickly, but some of the basics like sitting on command proved more difficult. I advised their owners to practice these basics as they give them the opportunity to assume a leadership role over the dogs while using positive reinforcement to reward desired actions or behaviors. At this point, one of the owners mentioned that while the dogs were calmer, it wouldn’t last if they pulled out the leashes as it was a big trigger for the dogs. Always up for a challenge, I had her go and get the leashes and go through the ritual they used when putting the dogs on the leash. While the dogs excitement level went up a bit, their owners said it was nothing compared to the level of excitement that usually accompanied the retrieving of the leashes. I explained that the work we had done earlier was impacting the dog’s behavior in a positive way and stressed how important it will be for them to continue to practice so that these new behaviors become the new normal. I made some suggestions about leashing the dogs up for future walks to help redefine the leader follower relationship. The primary one was stopping or pausing any time the dogs started to get too excited. If we consistently stop when the dog starts to show excitement, in conjunction with an activity the dog really likes, it usually doesn’t take long for the dog to start adopting a calmer demeanor all the time. By the end of the session, both dogs were completely mellow, listening to their owners commands and needing few corrections. It will take some practice, but if their owners continue with the exercises and rules we introduced during the session, this new calm energy level is what the dogs and family will bring into the summer and beyond.